The 152mm 2S19 MSTA-S (Russian: named after the Msta River) self-propelled howitzer entered service with the Russian Army in 1989. 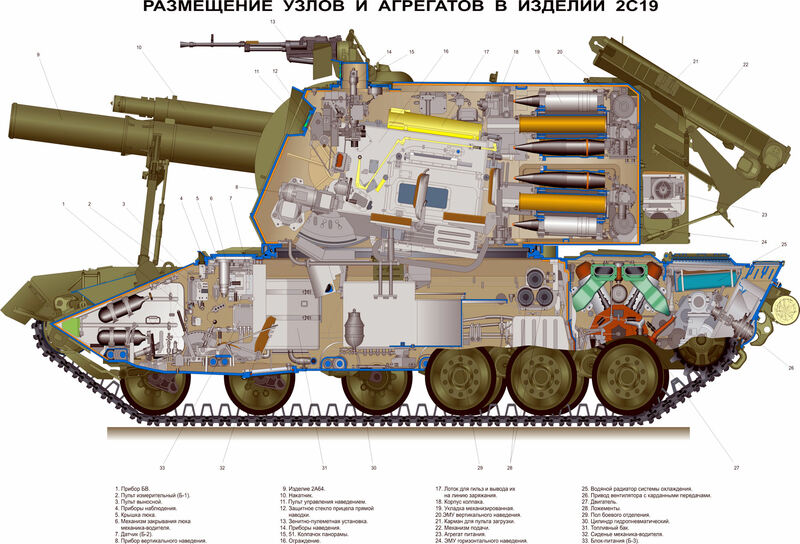 While the Russian Army hoped to replace all of its 122mm and 152mm self propelled artillery with this howitzer, budgetary constraints mean this replacement will not be completed any time soon. At least one 2S19-equipped regiment served in Chechnya as part of the 8th Army Corps. Msta is named after a river in the Ilmen district, a break in the previous Soviet practice of naming self-propelled guns after flowers or plants. One of the most extensive artificial waterway systems ever built is to be found in Russia at the head waters of the Volga and Msta rivers. The Volga River, the greatest in Europe, 2,325 miles long, and navigable nearly its whole length, rises in the Province of Tver, within 200 miles of St. Petersburg, and empties into the Caspian Sea in the opposite extremity of European Russia. The Msta River has its sources interlaced with those of the Volga, but flows in the opposite direction, and its waters find their way, through the Volkhoff River, to Lake Ladoga, and ultimately to the Baltic Sea. The sources of the Volga and Msta are in a flat, marshy, wooded country, about 650 feet above sea level, covered with innumerable lakes. For a long period in the past these two river systems were connected by artificial waterways, and the Beaport of the upper Volga was upon the Baltic. The extreme low water which is characteristic of the Volga and other Russian streams prevents navigation in their natural condition except in seasons of nigh water. To ameliorate this condition, advantage was early taken of the exceptional reservoir facilities offered by the lakes referred to, and dams of a cheap character were constructed across their outlets. The reservoir system has now been developed to great perfection and effects an important improvement both in the Volga and the Msta, rendering them navigable for nearly three months longer than they would be without this aid. The canal of Novgorod, or of Sievers, was made for avoiding lake Timen, between the mouth of the Msta river and the commencement of the Volkhov river. It was begun in 1797 and opened for navigation in 1804. Msta-S comprises a turret mounted on a tracked armored chassis based on elements of the T-72 and T-80 main battle tanks. It is manufactured by Uraltransmash of Ekaterinberg, Russia. A battery can deliver projectiles on a target and move on to the next firing point before reaction firing. The howitzer's armor gives protection against armor-piercing bullets and projectiles. The 2S19 can also produce a smokescreen by injecting diesel fuel into the exhaust outlet. The 21-hp gas turbine AP-18D Auxiliary Power Unit provides power for turret operations when the vehicle engine is shut down. The 2S19 can run on six different types of fuel including gasoline, aviation fuel, and spirit alcohol. The 2S19 152mm self-propelled gun, combined a version of the 2A65 towed 152mm gun with a new chassis based on T-72 and T-80 tank components. The 2S19 was developed to combine the roles of the 2S3 and 2S5 in a single vehicle. A major aspect of the program was to develop an automated ammunition handling system and improved fire controls to provide the capability to avoid counter-battery fire by rapid relocation. In the 1985, work began on a new self-propelled 152mm howitzer that would replace the well-known 2S3 Akatsiya. Even though it had undergone several modernization and update programs, the 2S3 had fallen behind equivalent other contemporary artillery weapons. In part, this was due to the fact that its 2A33 howitzer was a modified version of the D-20 towed 152mm howitzer developed in the 1955, and the chassis was part of the GM-300 series which had first seen service as the chassis for the 2K11 Krug (SA-4) surface-to-air missile complex in 1964. Therefore, the decision was made to develop a completely new self-propelled artillery weapon (SAU). The weapon began development under the codename Ferma (Dairy Farm) at the Uraltransmash Works, under the direction of chief designer Yuriy Tomashov (deputy chief designer Mikhail Tretyakov). The resulting work produced a completely new vehicle, which was accepted for service in 1989 as the Msta-S (where the "S" stands for self-propelled; this is to differentiate it from the 2A65 Msta-B, which is the Buksiruemyi or towed version). For that reason, the Uraltransmash Works also created the 2Kh51 special purpose training system to educate the crews that will use the 2S19. The first series produced 2S19s were made at the Uraltransmash Works plant in Yekaterinburg, but production was later shifted to the Bashkiri Machine Plant (STEMA) in Sterlitamak, a new plant geared towards self-propelled artillery manufacture. The armor on the 2S19 provides reliable protection for the crew, ammunition supply, and all equipment from small arms fire or shell fragments. The 2S19 consists of an armored hull and turret. The diesel engine, transmission, control systems, and suspension are located within the hull. The running gear of the chassis is formed from standardized parts from the T-72 and T-80 tanks. The 2S19 is powered by a twelve-cylinder V-type V-84A diesel engine producing 840 horsepower; this engine can use any of six different types of fuel. It is a high-speed four-cycle liquid-cooled diesel motor. The V-84A is also used in the latest models of the T-72 tank. It can also be replaced by the V-46 family of engines (which produce 780 vice the 840 horsepower of the new engine). The gearbox has seven forward speeds and one in reverse. The electricity is provided via four accumulator batteries producing 27 volts direct current power. The running gear itself (per side) consists of six road wheels, an idler wheel with track tensioning device, a drive wheel with bolted-on toothed drive rings, and five return rollers. All of the road wheels, idler wheels, and drive wheels are identical to those used on the T-80 tank. The suspension uses long torsion bars, which cause the corresponding road wheels on the right and left sides to be offset. The vehicle uses the suspension components of the T-80. The first, second, and sixth road wheels are equipped with regulated telescopic shock absorbers, which are controlled when firing the weapon by blanking off their oscillations. This means that the weapon does not need to use auxiliary firing jacks or spades for stabilization. The 2S19 uses the 580 millimeter wide track with rubber inside facing, which is identical with that used on the T-80 tank and 2S7. The suspension can handle firing all types of projectiles without the necessity of having to previously prepare a firing position. The enclosed welded turret contains the 2A64 howitzer with its aiming and pointing mechanisms, an automated shell selection and handling mechanism, the conveyor which can be used to bring up shells from the ground, the ammunition supply with its programmable selector, an execution device which brings the selected shell from the ammunition supply into line with the 2A64 howitzer, the onboard power supply with automatic power regulation, the filtering and ventilation system, the communications suite (internal intercom, external wire and radio), the PZU-5 antiaircraft machine gun mounting, a mechanism to hermetically seal the breech of the howitzer, and the device for flushing gases from the fighting compartment. The armament of the vehicle consists of the 2A64 152mm howitzer mounted in the turret, and the 12.7mm NSVT antiaircraft machine gun mounted in the PZU-5 antiaircraft mount on the commander's cupola. The 2A64 is a modified version of the 2A65 towed howitzer. Fire can be conducted with this weapon using the 30F-45 high-explosive fragmentation round (up to 24,700 meters) and the 30F-61 (to a range of 28,900 meters), the 30F-23 cassette round (carrying 42 anti-armor sub-munitions and reaching out to 26,000 meters), active radio jamming projectiles from the 3NS30 family (to 22,300 meters), the 3vDTs8 special projectile, and others. It can also use all standard ammunition for the D-20 and 253 howitzers, as well as guided projectiles such as the 30F39 Krasnopol laser guided projectile, which includes the 3V0F64. Target illumination for these rounds can be carried out by an artillery observer with the 1D15 (PP-3) or 1D22 laser devices. Thanks to the semiautomatic shell handling system, the crew of the weapon can achieve a rate of fire of 7 to 8 rounds per minute with the internal ammunition supply and 6 to 7 rounds per minute when conveying shells up from the ground.9 This translates into an eight-tube battery of these howitzers being able to place nearly three tons of steel on target in one minute. At maximum range, that is nearly 70 shells in the air at one time before the first one hits the target. At a firing range 200 kilometers from Abu-Dhabi, a demonstration was held of the firepower of the 2S19 (Msta- S) at the 1993 International Defense Exhibition (IDEX-93 ). Using 40 Krasnopol laser-guided projectiles, the 2S19 hit 38 targets at a range of 15 kilometers. Since the main ammunition supply is located in the turret, it can be selected and loaded no matter which direction the turret is pointing in relation to the hull without a problem. The loading mechanism also supports the conduct of fire at any angle of traverse or elevation at the maximum rate of fire. To assist the loader — who would have to handle a 43.56 kilogram load (the OF-45 projectile) the projectiles are loaded automatically. The shell racks are designed to handle various types of ammunition, to include special rounds. To search for the required projectile on the ammunition conveyer, and to control the entire process of loading the weapon, there is a loading system control mechanism. Besides that, it can count the number of each type of projectile carried. There are two separate conveyors, one each for projectiles and charges. Each of is served by its respective loader, and that increases the rate of fire from 7 to 8 rounds by 8 howitzers by 43 kilogram average shell weight equals 2,408 to 2,752 kilograms (5,309 to 6,068 pounds) of charge which can be loaded in a semi-automatic fashion. The ejection port for the expended casings is located in the turret above the howitzer. Having the ground conveyor provides for the conduct of fire using the selection of on-board ammunition and not wasting the on-board supply. When preparing for movement, the ground projectile conveyor is stowed on the back of the turret, whereas the ground charge conveyor is stored inside the turret. The 2S19 has two sights: the 1P22, which is located in a rotating armored cover in the roof of the turret, and the 1P23 direct fire sight, the observation window for which is located in the glads plate of the turret. The 1P22 is a 3.7 power optic and has an automatic stabilization feature in the horizontal plane, which works when the vehicle is not canted more than five degrees in either direction. In travel mode, to the right of the sight is a protective curtain which can be wrapped around the sight to protect the view piece. The 1P23 has a power optic and can track through angles of elevation of -4 to +55 degrees The 2Eh46 howitzer drive mechanism is electric and automatically controlled in the vertical plane; horizontal movement is directed from a control panel. The automatic return to the correct angle of elevation after each round is fired simplifies the work of the gunner. When firing, the gunner only has to perform a single operation — he has to keep the panoramic sight leveled on his aiming point. The commander also has the mechanisms for aiming and firing the weapon. When the electrical system is turned off, there are backup manual controls for the weapon for loading and aiming. The 2S19 is equipped with a data transmission and receiving system. The data can be send via landline or by radio via the IV122 device over distances of up to 500 meters. This includes a system to control gunlaying, which is coordinated with the fire direction center vehicle. The PZU-5 is provided for defense against lightly armored vehicles, helicopters and aircraft, and is analogous to the same system provided to the T-64 tanks and several models of the T-80 tank. It can be fired from inside the turret via remote V-18 controls. The 12.7mm NSVT Utes (6P11) machine gun has an sighted range of 2,000 meters and a rate of fire of 700 to 800 rounds per minute. Its range of elevation is -3 to +70 degrees. It is provided with five belts of ammunition, with 60 rounds in each belt. To provide for operations when the main engine is shut off, the vehicle is provided with an AP-18D autonomous power supply unit — this is a gas turbine generator producing 16 kilowatts of power. It can operate without interruption for up to eight hours. The 2S19 is part of an artillery firing battery complex (OBAK). The complete OBAK consists of a commander's vehicle (based on a BTR-80 chassis), a senior officer of the battery's vehicle (based on a Ural-43201 truck), and up to eight 2519 weapons. Any size artillery combined unit may be formed from these OBAK organizations. The 2S19 is offered for export. In this condition, the vehicle is priced at $1.6 million. Special export versions of the 2S19 in 155mm caliber are also being offered, which will then permit the weapon to handle any NATO ammunition type of that caliber. By February 1991, the Soviet Army had accepted some 371 2S19s and 2A65s weapons into service and by 1 January 1995 there were 563. Russia artillery designers have began working on an improved version of the weapon, the 2S30 Iset. In addition, enhancements to the 2S19's ability to fire guided projectiles such as Krasnopol, utilizing a remotely piloted vehicle (RPVs) as a source of laser target illumination was also being development for current 2S19s and its future follow-on system. 1K17 Szhatie - a "laser tank" armed with a battery of lasers meant to disable optoelectronic systems; uses Msta-S chassis and turret. 2A65 152 mm howitzer - a towed version of the same gun. 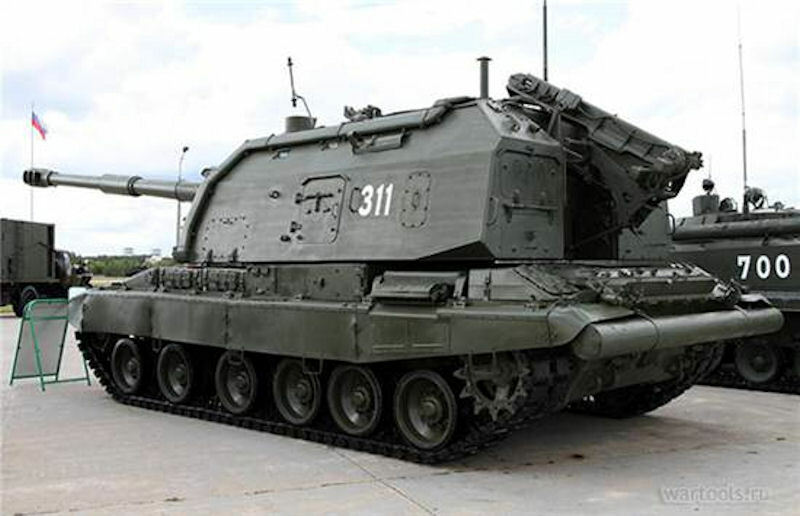 2S19M1 (2000) - Improved version with automatic laying system and Glonass. 2S19M2 (2013) - Improved version equipped with a new automatic fire control system which increases the rate of fire. Digital electronic maps are now available which significantly speeds up the terrain orientation in difficult geographical conditions and allows performing faster and more efficiently firing missions. 2S19M1-155 (2006): A Msta-S upgraded export version (155mm) was designed, fitted with an L/52 gun with a range of 40+ km. At "Ural Expo Arms 2002" exhibition in Nizhni Tagil an operational 2S19M1-155 (with a 155mm howitzer, corresponding to NATO-adopted 1989-year standard) was demonstrated. The howitzer itself was designed by Motovilikhinskie Zavody - its is 52-caliber long, its chamber's volume is 23I. The system uses NIMI-designed 155mm explosive/fragmentation shells; firing range: 33.8km. It also can fire foreign-made shells, such as M107, L15A1, M795, DM652, ERFB and other, for instance with MTLS-type charge. Krasnopol-Ms and Centimeter M1s can be fired as well. 2S27 "Msta-K" - Wheeled variant (K = kolyosnij), based on a 8x8 truck chassis. There were several different prototypes, including one based on a KrAZ-ChR-3130 and two based on the Ural-5323 (with and without turret). 2S30 Iset: 155 mm gun (NATO caliber) intended for export by the Russian Federation. At the air and space show in Zhukovsky near Moscow and later on the IDEX 93 exhibition in Abu Dhabi, the 2S19 MSTA was introduced in August 1992. It showed a lot of interest in acquiring seeds of the howitzer. Therefore, a variant was designed for export and was named 2S30 Iset. The eastern Volga River system is on the west side of the Ural Mountains, while the system of the Ob River is east of the Urals. On the west, the Chusovaya River flows into the Kama, the great eastern tributary of the Volga, from a notch in the Urals through which also passes the northern branch of the trans-Siberian Railroad. On the east side of the Urals the head waters of the Iset River, which is part of the Ob System, are very near this gap in the mountains, and the head waters of the Chusovaya. 2S33 "Msta-SM" - Improved version. No details available. 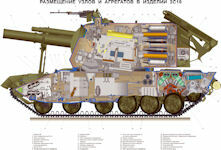 The deeply modernized 152-mm self-propelled howitzer (SAU) 2S19M2 was first introduced at the IX International Exhibition of Arms, Military Equipment and Ammunition "Russia Arms EXPO-2013". The 2S19M2 equipped with programmable charging mechanisms complex, modernized management system guidance and fire. Modernization of ACS provided increased (up to 10 rounds per minute) rate, the performance of the maneuver self-determination of the current position. The equipment improved "Msta" can automatically calculate settings for firing from concealed positions. Implemented automatic leveling instruments and restoration pickup after the shot. It provides "simultaneous fire attack" mode in which the target is hit simultaneously by several shells fired from the same gun on coordintated trajectories. Weight of teh self-propelled gun [SAU] is 43.24 tons. The barrel length 47 calibres. Maximum range of 29 km, including the guided missile "Krasnopol" - up to 20 km. Ammunition supply is 50 shells. The 780-hp engine accelerates the self-propelled 60 km/h. with a range of more than 600 km. In June 2013 the first modernized self-propelled artillery howitzer 2S19M2 entered service with the Russian army. The infantry artillery brigade of the Southern Military District of the Russian army received the first upgraded self-propelled artillery howitzer "MSTA-S" 2S19M2. All the commanders of the new MSTA-S have undergone training. Russia’s Uralvagonzavod (UVZ) machine industry company will deliver 42 self-propelled artillery to the Russian Armed Forces by 2019, the research and production corporation’s director said 07 sEPTEMBER 2016. "Our most significant contract was signed for Uraltransmash [division of UVZ, to deliver] 42 self-propelled MSTAs before 2019," General Director Oleg Sienko told reporters at the Army-2016 military forum near Moscow.